I've got a 2001 Pontiac sunfire that is over heating. I'm in Wyoming, where it is -24 degrees out. We changed out the thermostat today and drained the 50/50 antifreeze and put in full strength. It still is overheating, do you have any other suggestions? You need to dilute that coolant immediately. Full strength coolant will give you no protection at all. Maximum protection is at about 60/40 but 50/50 usually gives you -35. Thank you, we will do that right away. Will this help with the overheating problem? YES! Full strength actually turns to slush before a strong mix if needed. Plain 50/50 can in wilder cold but will contract and not crack anything but may not flow. No, i doubt it. You are going to have to investigate into what is causing that. You probably need to start with a cooling system pressure test to find any leaks. 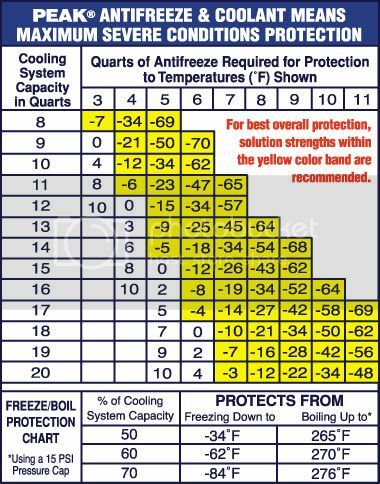 Determine if it could have frozen already from last of coolant mix as you seem to already suspect that. Which engine? Does it overheat at idle, while cruising, or both? Heater blowing hot air? I lack the chart of @ what mix as tested will shrink and not expand or go slushy but plain recall it's well above "0" degrees of mix will not expand. That only means physical damage from cracking things NOT that it will behave for use in those temps! True air temp of -24F many cars will have troubles if not garaged or run recently or w engine heaters. Watch out for testers and real protection levels. Most are way off! Even brand name "Prestone" ones I went thru a few to get a good one! Dang $1 buck floating ball things were better than that! I'm always watching US weather and know it's cold in places that rarely see that. I'm in MA and worst all last year was -8F right here and never know. Sorry for the book - the vehicles first exposed to the shock can leak at water pumps as metals of shaft and housing may not stay tight with seals shrinking metals don't always do so at same rate so loss of coolant is was probably the first problem - low coolant level then the overheat and who knows what that could have done? That's the B*ITCH of it all. Now just filling these is a PITA too to know it's truly full. One more: If working on this at those temps or even higher watch out for your hands. Freeze burns are no less harmful than heat burns! Great for the protection chart. I was looking for the expansion chart for breakage be it for RV, off season homes you need to know that. Some of the places seeing these REAL nasty temps are getting that for the first times to them OR the vehicle OR anything that runs. Diesel turns to jello and so on. Just do as I do, hide till MARCH! Haha, Tom! I wish I could hide till March or April! Well, Thank you everyone for all the help. All of the antifreeze we put in last night was on the ground this morning. Looks like we need a new water pump. The worst part is our truck broke down last night too. We had to go get a new battery for that this morning. Brutal weather here in Wyoming!! Everybody stay warm!! Pick a warm place to work. Did a water pump now so long ago I forget what year but was about -10F and the car wouldn't fit all the way into a garage. Yikes tools get cold! Hard to do much with heavy gloves too. Warm up any rubber hoses and things with a hair blow dryer if needed. That cold is coming this way not here yet but soon. Would have been nice to know which engine it has. If it is the 2.4L, those pumps are fun to change. It is a 2.2L. This has gotten to be something we will have done by somebody else. To cold here to be crawling under cars or just plain working on them outside. Thanks for your help. I don't blame you a bit if your choice is working outdoors! NOT me in that. Done with this stuff but can heat shop and have to about 100F and needed to once only to fix and test out air conditioning in below zero temps with the car destined to Florida the next day!